Brits travelling to Spain reached peak numbers this summer with 2.3 MILLION visiting in August and spent £2,000 every HOUR. 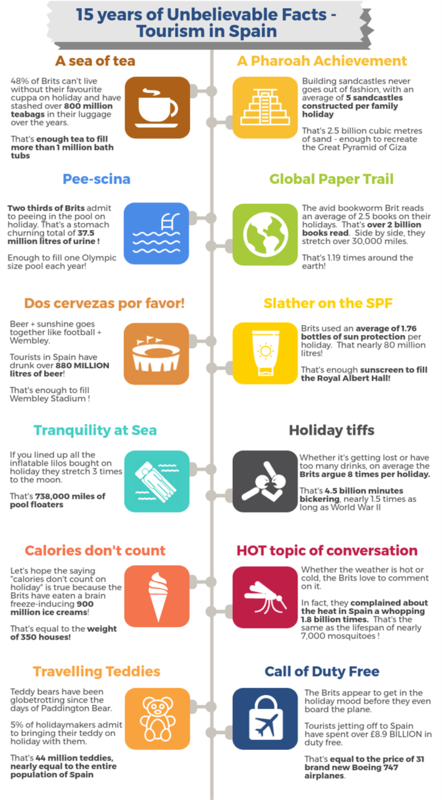 Latest infographic reveals what British tourists get up to on their Spanish holiday. Spain-Holiday.com lifts the lid on some of the quirky, fascinating, and sometimes stomach-churning trends of the Brits abroad. Looking forward to a dip in the hotel pool on your Spanish holiday? You may want to think again! 151 foreign tourists arrive every minute in Spain. Brits lead the way in numbers holidaying in Spain with 34 Brits arriving every minute. 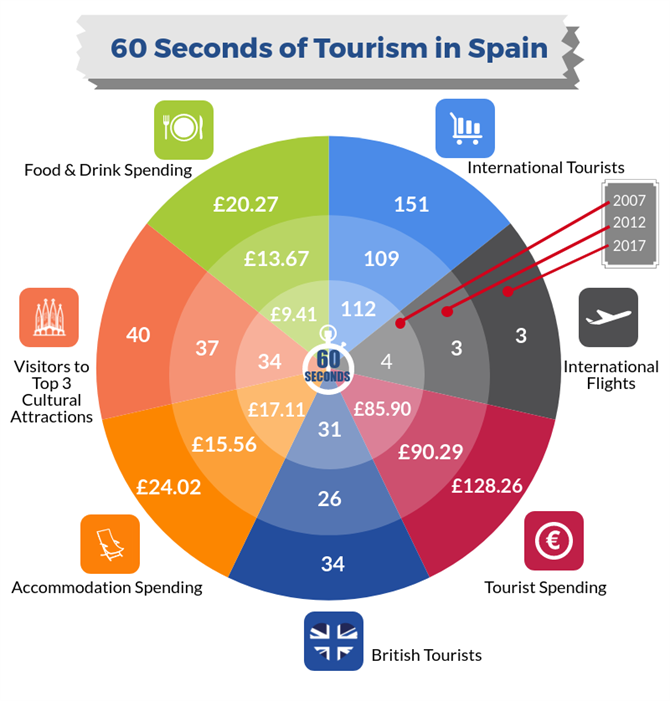 Brits are the biggest spenders in Spain accounting for more than 20p in every pound (20.8%) of tourist spending. Brits spend the most on food & drink on holidays – more than £185,000 each month – almost as they spend on travel and accommodation. According to latest figures released this week, from the Spanish Institute of Statistics (ine.es), Spain has received a record-breaking 57.3 million visitors between January and August this year. That’s an average of 236,700 visitors entering Spain every day with nearly one in every four (23.09%) visitors coming from the UK. No-one would be surprised by the choice of Spain as the most popular holiday destination for Brits. With plenty of budget flights, guaranteed sunshine and cheap holiday deals, Spain still rules as far as the Brits are concerned. To celebrate the 15th Anniversary of the Spanish holiday rental online marketplace, Spain-Holiday.com has released interesting and in-depth research into Brits on holiday in Spain over the past 15 years, from the birth of online booking websites, through the years of global recession, to the latest record breaking numbers in Spanish tourism. 15 years ago, most Brits would pop down to their local high street travel agent to book their annual summer package holiday but with the advent of low cost airlines and online booking websites such as the online marketplace for Spanish accommodation, Spain-Holiday.com, booking holidays direct are on the rise. Comparing the latest figures to historic tourism data from 15 years ago, the numbers of visitors continues to grow but also spending has increased particularly on accommodation and food & drink. The number of Brits holidaying in Spain has increased more than 50% over the past 15 years, despite a dip in numbers during the recession. Spain-Holiday.com dug deeper into the trends of Brits abroad. What they discovered is some pretty incredible trends – almost unbelievable at times – and in case, quite stomach-churning. When it comes to how the Brits enjoy their time in the Spanish sunshine, popular family beach activities include building 5 sandcastles, reading 2 books and getting halfway through a third one, eating 8 ice-creams (but dropping 2 of them), commenting on how hot it is 8 times and of course, no family holiday would be complete without an argument, or 8, to be precise. Brits have taken over 800 million tea bags in our luggage and made enough cuppas to fill one million bathtubs despite declaring “it’s doesn’t quite taste the same as back home”. Our sandcastle building habits have used 2.5 billion cubic metres of sand – enough to recreate the Great Pyramid of Giza. A must-have purchase is an inflatable lilo with this year’s seeing a craze for unicorns and flamingos. Stretched out, these inflatable floaters would stretch 738,000 miles – the distance to the moon and back, and back again. Sun protection is a holiday essential and with guidelines stating we should apply a shot glass worth of sunscreen per application, we have gone through 79 million litres of suntan lotion – enough to fill the Royal Albert Hall. The Brits love to lose themselves between the pages of a good holiday romance novel or thriller on holiday. Stacked side by side, the books would stretch nearly 30,000 miles, more than once around the world. And probably half of those are part of the 50 Shades of Grey Trilogy! Recent findings also revealed a rather unsavoury holiday trend amongst Brits with 67% admitting to peeing in the pool while on holiday. If two thirds of the 235 million British tourists took just one tinkle in the pool, that would amount to 15 Olympic swimming pools filled to the brim – that’s one Olympic swimming pool’s worth of pee per year – surely the best argument for staying in a villa with private pool on your next holiday! The full findings of the study are revealed in the infographic below. According to Jannich, there’s more to the numbers than mere entertainment. For those looking to step off the well-beaten tourist track when planning and booking their 2018 holiday, Spain-Holiday.com offers over 10,000 holiday rental properties all over mainland Spain, the Canary Islands and the Balearic Islands as well as local expert knowledge about destinations, cultures and traditions.